Reese is about to get on an airplane when the world goes nuts and birds start taking down planes all over the world. Suddenly, it turns into a post-apocolyptic nightmare and Reese and David are on the run until they crash their car near Area 51. From there, life returns to mostly normal...that is until Reese meets Amber. 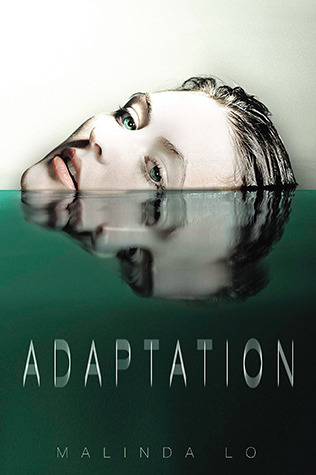 Adaptation had a great start! For the first quarter of the book, I was hooked. It was fast paced, mysterious, intriguing and a little bit scary. Then, there was an entire change of pace. This book is really broken into three parts: thriller, contemporary, paranormal. The crazy, action packed first part. The goose-bump inducing romantic and rule-breaking second part. Then, the dystopian, strange and un-expected third part. I liked each part independently. I liked the action when there was action. I liked the romance between Reese and Amber (yes, two girls). I liked the tension between Reese and David. I can't wait to see where this story is going and I want Amber back! I spent most of the book not knowing what was going on. What are we dealing with here? Aliens? Robots? Super humans? But honestly, I was so distracted by Amber and Reese that I didn't care about aliens or adaptations or whatever. And I probably should have. Malinda Lo is a great writer with a great story here. I love, love, love that she fearlessly ventured into a girl/girl romance. I connected with Reese and empathized with her struggle. Lo proved that a female love connection can be just as hot as a male/female and that the female love interest can be just as swoon-worthy. For every reader. I always love reading your reviews on books!!! Whaaaat? This sounds so trippy! Haha.